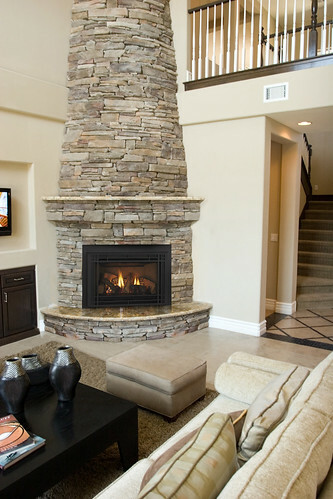 The large QFI35 gas direct vent fireplace insert will turn your labor-intensive drafty fireplace into a magnificent, attractive, and convenient high output heat source. A classic herringbone ceramic brick firebox is the perfect background behind the beautiful craftsmanship displayed by the three available fronts. This selection offers different styles, finishes and colors that will allow you to easily customize this insert to compliment your decor. Of course, these fronts only enhance the dancing golden flames and beautiful glowing embers that mingle to create an amazingly realistic fire. The IntelliFire™ Plus Ignition System is an "intelligent" control system providing energy conservation and the comfort of a roaring fire, all at your fingertips! Our advanced flame technology produces high heat output levels, easily heating up to 1,520 square feet with an input of up to 35,000 BTU’s. The QFI35 is an excellent heating solution for your home!